EDC Employees are involved in community activities. At June 1st EDC Volunteers in cooperation with Education and Enterprises Foundation organized Children’s Day for children from Refugees Center and Home for the Single Mothers. It was all day event with many attractions prepared for kids: painting children’s faces, doing animals form balloons, drawing sketches on the pavement, search for treasure and many others. 25 EDC volunteers played with 150 kids! We spent a great time together. In cooperation with the Urszula Jaworska Foundation, EDC employees voluntarily took part in blood tests and became Bone Marrow Donors. EDC organized lectures on cancer prevention for their employees and also actively participated in organizing The 6th INTERNATIONAL WEEK FOR CHILDREN WITH LEUKEMIA in Turkey. 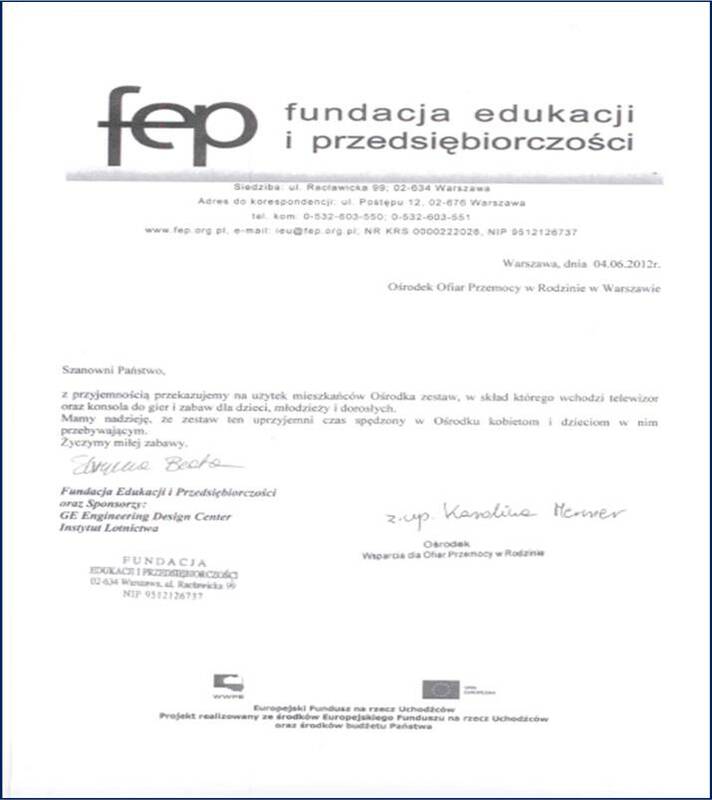 EDC participates in a charitable campaign the goal of which is purchase of wheelchairs and prostheses for disabled people (more information available on the association’s website: http://www.dom-rodzina-czlowiek.org – sorry, Polish version only). 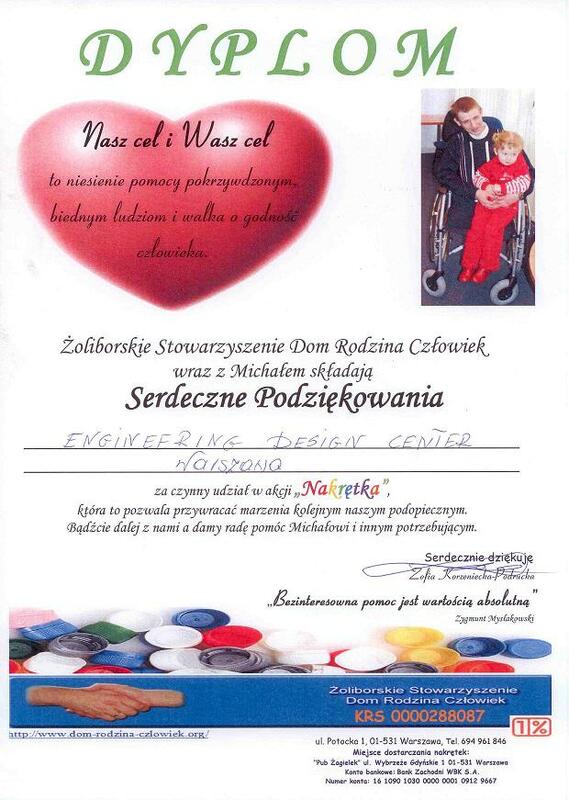 We would like to inform you that plastic caps collected in our office over the last several months have delivered to Żoliborskie Stowarzyszenie Dom Rodzina Człowiek (Home Family Human Association from Żoliborz), this time thanks to kindness of Kuba Mazurkiewicz from the IT team. GE Company Polska and the Warsaw Institute of Aviation offer a Scholarship Program to commemorate the victims of the Smolensk crash. 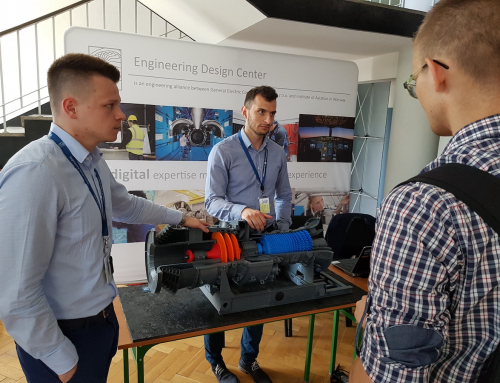 The scholarship is financed from a special grant that GE Aviation and GE Energy funded after the tragedy to be used for a cause benefiting Polish citizens. The scholarship’s name refers to Justyna Moniuszko, one of the victims of the Smolensk crash. 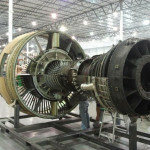 She studied at the Faculty of Power and Aeronautical Engineering (MEiL) of the Warsaw University of Technology and was also an intern at the Engineering Design Center. EDC Scholarship Program is addressed to the students of the Faculty of Power and Aeronautical Engineering. The goal of the scholarship is not only financial support but also popularization of the engineering culture among students by enabling them to participate in internships, meetings with engineers and career development trainings. A specially organized committee evaluates all applications and selects the best students for the program. So far, ten scholarships rounds have been granted to the winner applicants. The next one winner applicant will be selected for the program in October 2012.